When the energy curve for bulk system is calculated as a function of the lattice parameter, a sudden change of the number of real space grids is a serious problem which produces an erratic discontinuity on the energy curve. 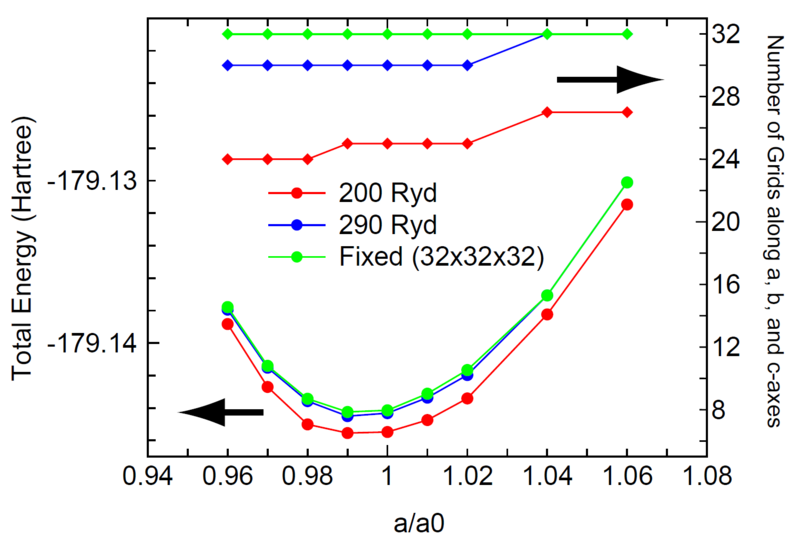 In fact, we see the discontinuity in cases of 200 and 290 (Ryd) in Fig. 6 when the cutoff energy is fixed. The discontinuity occurs at the lattice parameter where the number of grids changes. To avoid the discontinuity on the energy curve, a keyword 'scf.Ngrid' is available. When the number of grids is explicitly specified by the keyword, the axis is discretized by the number without depending on the keyword 'scf.energycutoff'. We see in Fig. 6 that the fixed grids with 32x32x32 gives a smooth curve, while the discontinuity is not so serious even in the cases of 'scf.energycutoff'. Figure 6: The total energy of bcc iron as a function of the lattice parameter, where the experimental equilibrium lattice constant a is 2.87 Å. A cubic unit cell including two atoms was considered. The input file is 'Febcc2.dat' in the directory 'work'.